Get at-a-glance information about all relevant mailing data in the reporting. Thumbnail preview, distribution list and send time, number of responders and openings distribution, clicks, bouncers and unsubscribers in both absolute numbers and percentages. 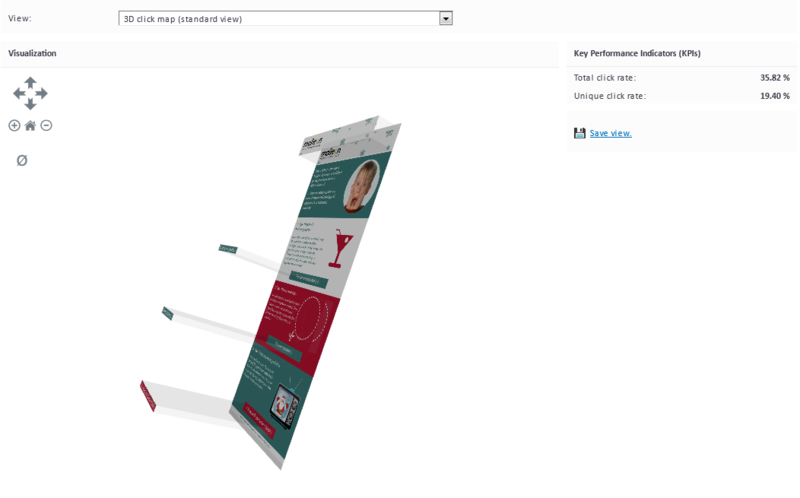 You can display the click distribution for your newsletter completely in 3D. Clicks will be shown as tridimensional peaks on the newsletter surface. This way you can see at a glance which links and newsletter areas have been the most successful. You can freely rotate and zoom the report and even view your newsletter’s reverse side. Graphical representation of newsletter openings over time, in this example split into openings on desktop and mobile devices. Graphical representation of newsletter openings by preferred device and time of day, in this example divided into openings on desktop (blue) and mobile devices (orange). In this example you can see a possible visualization for the openings rate of the Top 25 domains as tree map. Each rectangle represents a domain (e.g. web.de), rectangle size is proportional to the number of email addresses and the traffic light colour signal the response of the respective domain. 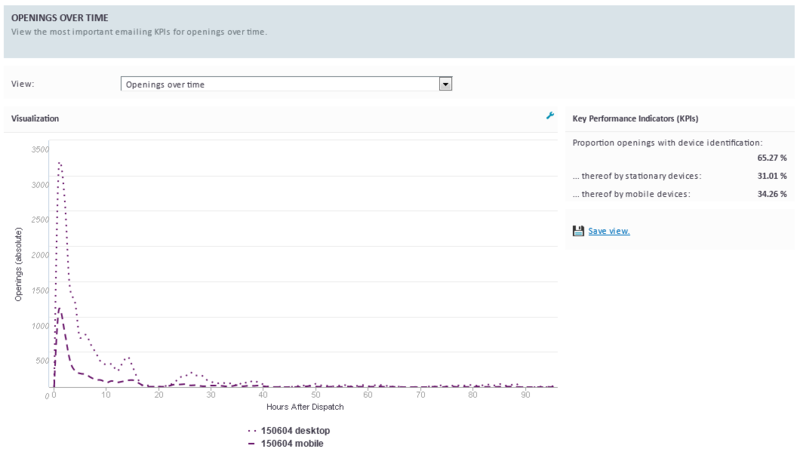 In this report you can instantly see distribution of the most important domains in your dispatch scale. 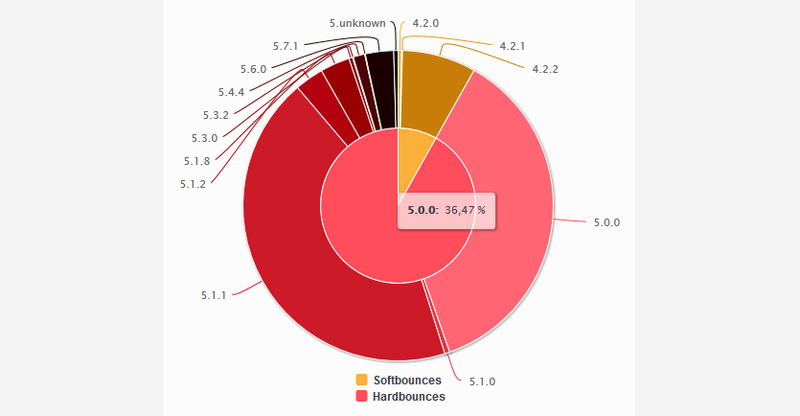 Bounce Distribution can, for instance, be displayed in a donut diagram. The inner diagram shows division of the two bounce categories (hard, soft), the outer ring displays the distribution of the individual bounce reasons per category. 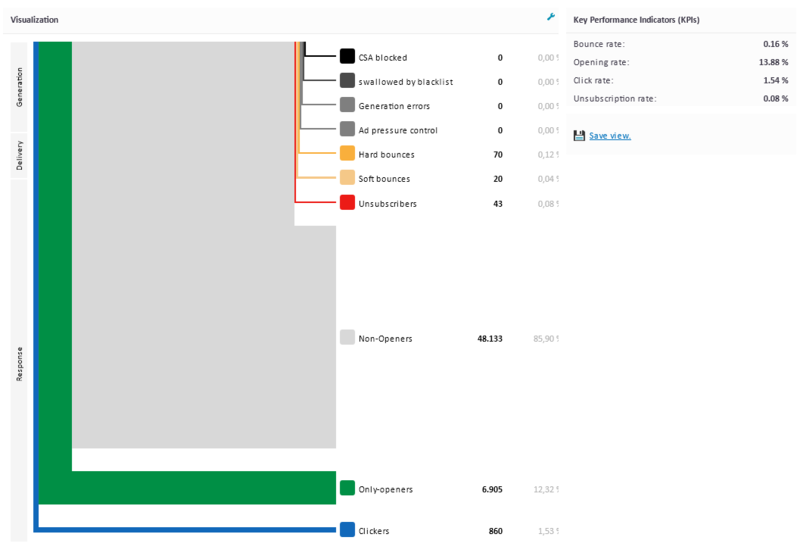 Key figures can be visualized in a zoomable timeline-area diagram. This type of graph gives a quick overview over the evolution of portfolio values over time, e.g. the number of your email contacts. The time axis is zoomable with the mouse and the displayed data can be segmented. For example, email addresses can be segmented into addresses that haven’t been on a distribution list, non-openers, only-openers, clickers etc. This report summarizes all pivotal recipient key figures, given that the dispatcher holds permission for individual user tracking. Response key figures will be compressed to more practictable scores. When geo information about the newsletter recipients is available, by place of residence or IP address, response data as well as profile features can be displayed in the graph. The XQ:Maileon Geo Report allows several display modes. By adding external data pools like population density or purchasing power you can run even more in-depth geo analyses. Maileon provides all reporting options considered standard in contemporary email marketing , e.g. 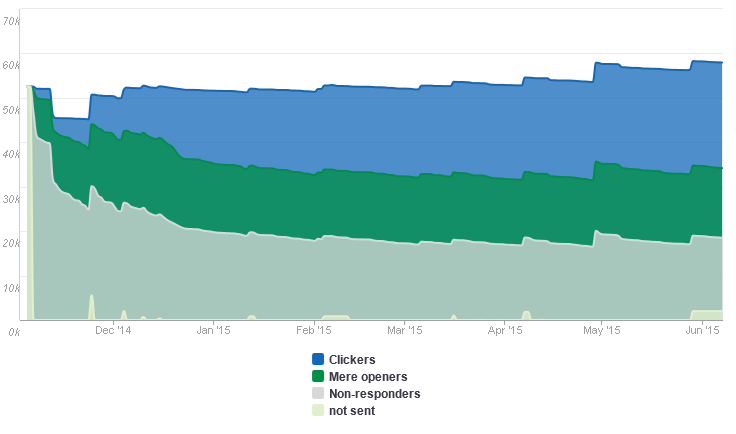 dispatch volume, bounce rates, opening and click rates, unsubscribe rates. Maileon features a number of new reports. These offer new, deeper, and more valuable insights on your contacts and mailings, thus revealing more potential for optimization and leading to more effective decisions. This includes new views on data and particular forms of graphical representation such as tree maps, hierarchic donut charts, heatmaps or Venn diagrams. You can easily and simply customize the analysed database, the visualization and the colours. Furthermore, you can save these as reusable views. All figures are available as overview and as detailed report. 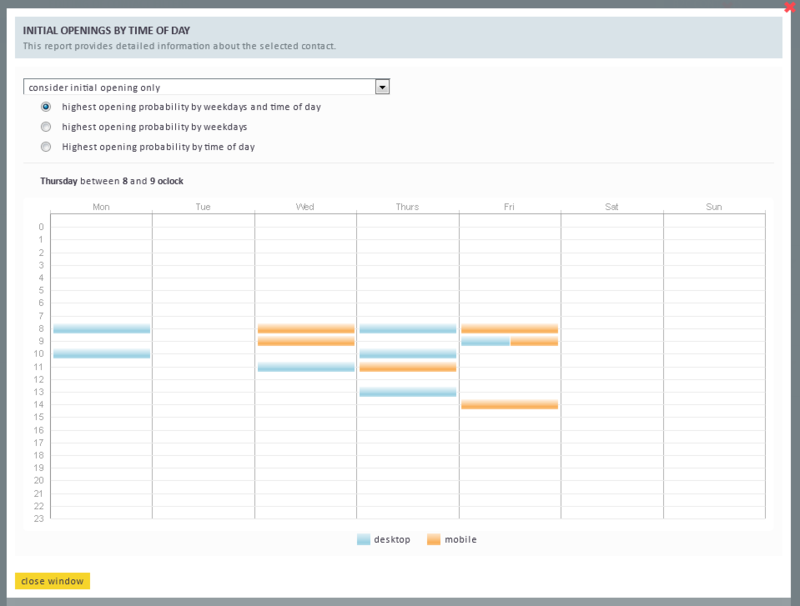 The overview reports can be displayed in the various Maileon dashboards if desired. All of our reports support any number of freely selectable data rows for any type of comparison report. Data row selection is done in a convenient way by means of reusable emailing and contact filters. Since you can save all report configurations as customized views you can lateron perform interesting comparisons without any additional efforts. The substantial metrics for all reports are displayed in an extensible key indicator bar along with the report. The key figures for selected partial data records are re-calculated in real time. For any report you can export database and graphics. 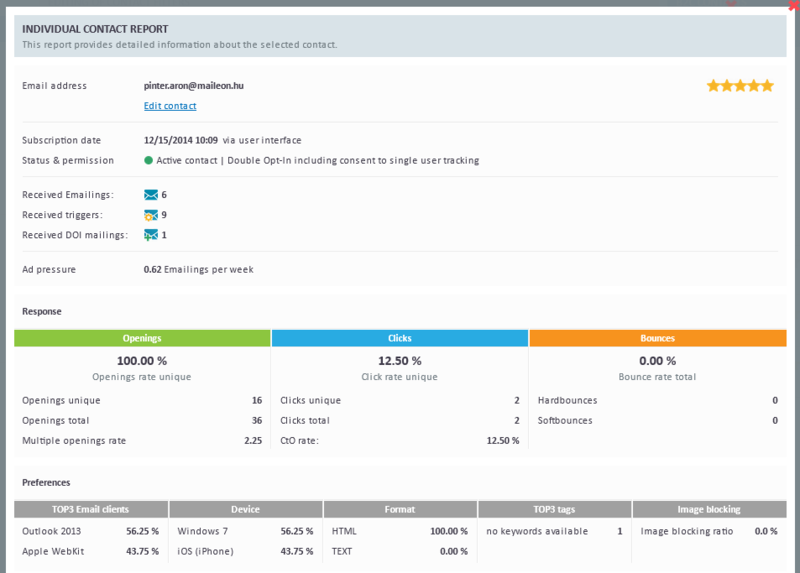 Our Maileon base report engine enables us to design, develop, test and put online one new report per week on average.